Japanese Mac Blog Macotakara has written a new report tonight, suggesting that Apple will maintain the Lightning connector on 2019 iPhones, but can finally include an 18W Fast Charger and USB-C for Quick Cable. 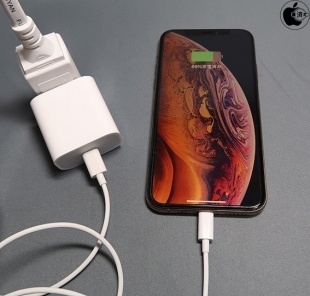 In addition, the next iPhone seems to continue adopting the lightning plug, but the charging cable has been changed to USB-C to lightning cable and it appears that the connected power supply can also be changed to the Apple 18W USB-C power adapter. 8W adapter allows fast charging with iPhone X charging from 1% to 79% in one hour. This rumor contradicts a previous report from the same site that expected Apple to keep the 5W adapter. Macotakara also repeats Ming-Chi Kuo's report that this year's iPhones will have the option of wireless charging of other devices.